Events are messages that are sent from one object to another. The component sending the event (aka firing the event) is the producer, the component receiving the event (aka handling the event) is the consumer. The producer of an event should have the ability to add and delete listeners for the events produced by itself. In short, a predefined method of the listener is invoked by the producer when an event is fired. Delegation: Event Listeners usually use delegation to accomplish their tasks. 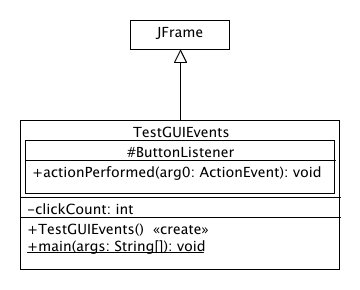 In this example we will create a new JFrame, containing a single Button. When the user presses the button, the window-title will change.